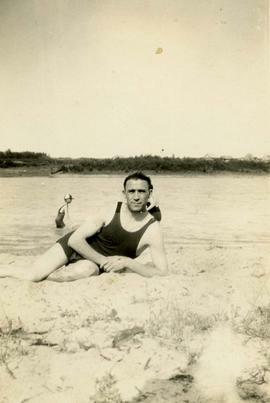 Photograph depicts Ben Dayson wearing a bathing suit laying on sand with water behind him. Photograph depicts Esther Nemetz and Ben Dayson seated in a garden (with Florence Nemetz? and Bill Nemetz?). Photograph depicts a JNF Tour group, including Rosa Stern, Rabbi S. T. Ferustein, Ben Dayson (far left) and Esther Dayson (second from the left) in front of the Eiffel Tower. Photograph depicts Dave Nemetz posing with a table. Photograph depicts from L-R Leo Nemetz, Dave Nemetz, Jack Barnett and Abe Stern. The four men are sitting at a table holding Passover hagadot during a Passover seder. Photograph depicts Ben Dayson reading from passover haggadah. Photograph depicts two men sitting on grass. The man on the left is likely Ben Dayson while the unidentified man on the right is holding a glass bottle. There is a park bench on the left side of the image. Photograph depicts Ben Dayson and an unidentified man posing for the camera. Photograph depicts an unidentified man in his hat and overcoat leaning up against a house.